Capital Improvement Plan is a configuration of Story Map Journal that can be used by the general public and other interested parties to review projects included in the Capital Improvement Plan. The Capital Improvement Plan (CIP) is a short range plan that identifies capital infrastructure projects in need of renovation, repair, and/or construction. The CIP relates these projected capital needs to the financial resources necessary to support their completion and the time frame in which both the financing and work will take place. 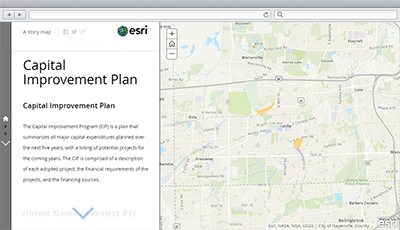 To deploy Capital Improvement Plan with the ArcGIS Solutions Deployment Tool requires specific software. Map Capital Improvement Plan A map used in the Capital Improvement Plan story map to review projects included in the Capital Improvement Plan. InfrastructureProjects_capitalimprovementplan A public feature layer view of the InfrastructureProjects layer used by public works personnel to communicate the capital improvement plan. Below are the release dates and notes for Capital Improvement Plan. An enhancement to the InfrastructureProjects_capitalimprovementplan layer to filter out completed projects. Support for ArcGIS Pro 2.1.